It is always amazing how quickly things change in the garden. I routinely make the same mistake and don't take enough "before" pictures. It is always fun and educational to look back on how the garden has changed, and I thank Nan Ondra at Gardening Gone Wild for this opportunity to reflect on changes in our garden. This month's Garden Blogger Design Workshop is titled "Time in a Garden" and the idea is to examine the effect of time on your garden. If you haven't visited Gardening Gone Wild, this is a great opportunity. It is a fantastic website/ blog covering a lot of information and has really interesting posts. The photo at the beginning of this post and the one immediately below are taken of roughly the same location, nine years apart. Both are looking to the northeast corner of our back yard, and to me really show the dramatic change in our yard. It also is a reminder of how I need to take more "before" pictures. Even this "before" picture was after we removed a dog house, cut down waist high weeds and began removing lawn and installing native plant garden beds. Below I have a series of pictures from 2000- 2009 from two angles. June 2001 - The first angle is looking north from our backdoor. By the pose and the proud look on our faces, I think we thought we were done landscaping, and we were eager to just sit back and enjoy the fruits of our labor. It is too bad we did not take any pictures before this- we had lived in the house for two years by 2001, and had done a bunch of work in the back yard. We installed the vegetable garden, reduced lawn, added native plant garden beds, and more. Nevertheless, there are plenty of changes in the photos that follow. May 2004- I guess we did not sit for too long. Here you can see we added raised beds to the vegetable garden, and expanded all our native plant garden beds. June 2004- We expanded some beds more and realigned the path. Click here for a post on how to build an urbanite path of your own. June 2005- The changes here included replacing a lilac with a hammock stand in the back part of the yard, and expanding some beds even more. July 2008- We kept expanding the garden beds and made the lawn even smaller. July 2009- Building the greenhouse was the biggest change, but we continued to expand the garden beds and shrink what little lawn we had left. 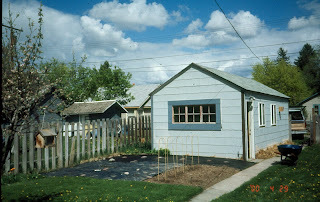 April 2000- This view is also of our backyard, looking to the northwest, and primarily shows our vegetable garden. 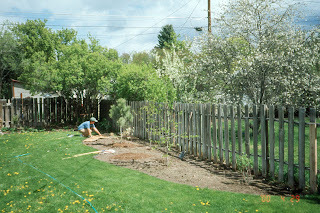 May 2004- We added raised beds and a grape arbor, started more native plant beds, and removed more lawn. 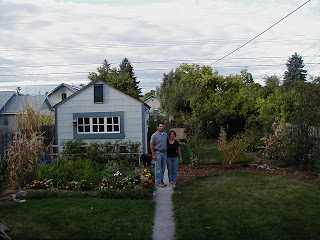 July 2005- We expanded the native plant beds, and painted our house, garage and bat house. July 2009- More native plants and a more mature landscape. A lot has changed in our landscape over the last nine years, and it was all done incrementally, and even some areas, installed, and reinstalled over that time. I hope this inspires some of you to tackle your own projects- just remember to take some pictures before you begin! Very cool! It's so clear how much better things look with all the natives! And I do think you're doing better than most of us with before and after pictures. It is good to see that you are still an artist at heart. The passion you had for Twisted Sister is (in a highly mediated fashion) evident in your gardening. We reflect outside what we are inside, is an extension or your innerself. Great pictures and great outdoor space. Congrats for all the transformation. What a transformation! You guys have done a great job, your yard is just beautiful! All I can say is Wow. I am not profound in any way, but I think you have done a marvelous transformation there. Inspiration! Wow. And I thought we had done a lot of work. All this proves is that if you are a gardener you won't be able to let anything alone! I love your greenhouse. I too found that I did not have enough "before" pictures. If anything, blogging has taught me that I need to take more pictures before and during processes. I enjoy it well but i cant say anything about it.i really love it. Fantastic photo series, David! You must be very pleased with what you've accomplished in your space. And how great that you thought to include links so we could find out more about the various projects. I love your greenhouse! I was just thinking today about how much I love the paint job I had seen somewhere on one of my blogs. And here it is :) Now to talk my husband into the colors! I laughed to see the garden beds expanding and expanding! Beautiful plants. I am another native plant nut, but they're a bit different from yours -- similarly low-resource-intensive, though. You decorated your yard very good! !